This autumn 45 Southside’s exhibition focuses on raku fired ceramics. 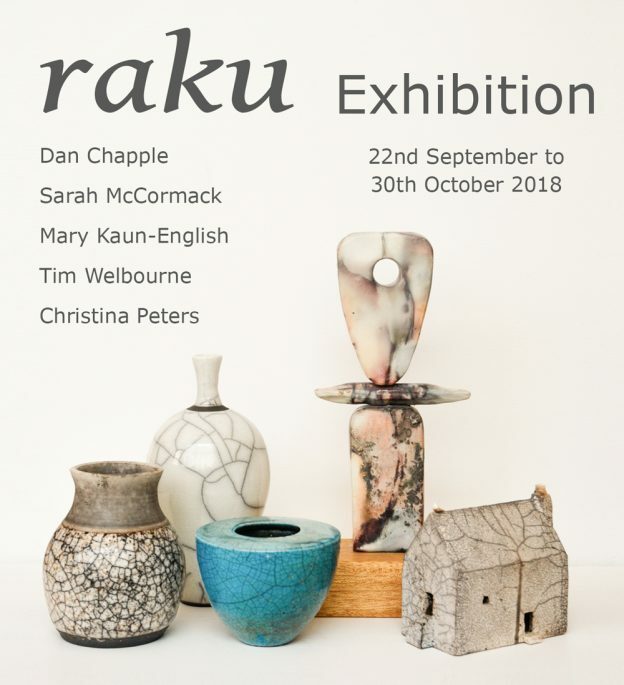 Five talented Devon and Cornwall based, artists showing their latest raku work. The raku technique originates from 16th century Japan and is a process in which pottery that once fired and then removed from the kiln is subjected to post-firing reduction (or smoking) by being placed in containers of combustible materials such as sawdust. The smoke blackens raw clay and causes crazing in the glaze surface. The crazing is a distinctive feature particular to the raku technique and a certain amount of unpredictability to this process makes every piece unique. The gallery also welcomes a new artist; California born Mary Kaun-English. She creates pit-fired and burnished sculptural pieces, a technique in which clay is polished to a beautiful sheen without the use of glaze. The participating artists are Dan Chapple, Sarah McCormack, Tim Welbourne, Christina Peters and Mary Kaun-English all creating their unique style using a similar firing technique. The exhibition will run from 22nd September to 30th October 2018. The opening view is on Saturday 22nd September from 3pm to 6pm, all are welcome. This entry was posted in Ceramics, Exhibitions on July 31, 2018 by 45 Southside.